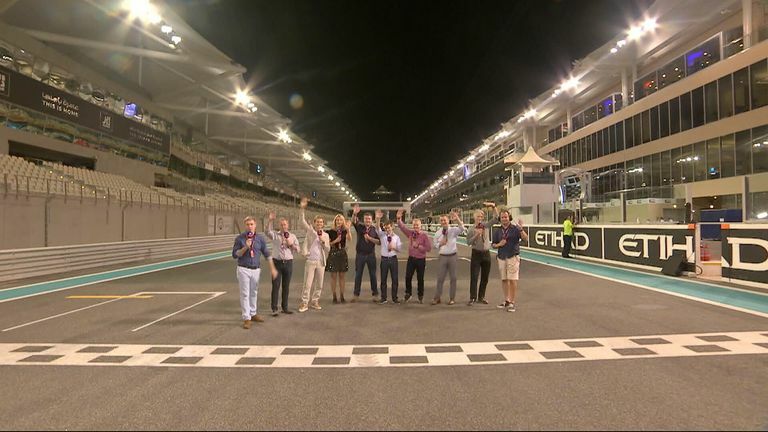 Winning eight of the final 11 races of the season, including the Abu Dhabi GP at a canter, he showed off his impressive physique and tattoos on the podium with an emphasis on 'still I rise' referring to an edgy and punchy poem by Maya Angelou. 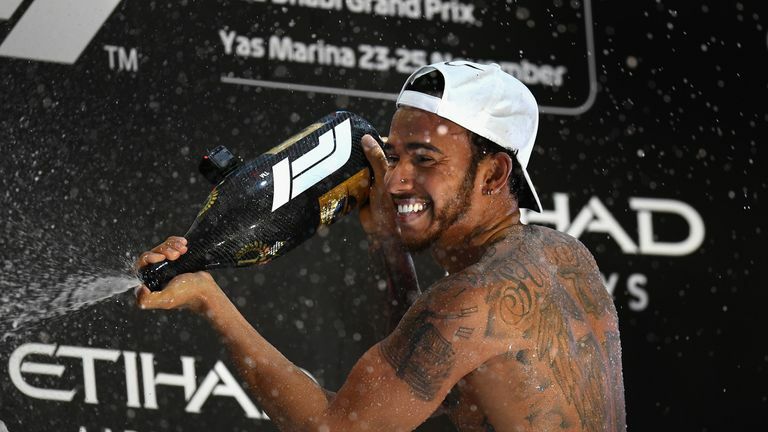 Lewis Hamilton strips off to celebrate winning the Abu Dhabi GP and the Drivers' Championship. Once again his qualifying performance under the floodlights of Abu Dhabi was spectacular, if not quite as mesmerising as his lap under the Singapore lights. He has it all; speed, starts, race craft, technical ability, patience, fitness, mind management. I've raced wheel-to-wheel against Senna, Schumacher, Prost, Lauda, Piquet, Hakkinen and even Stirling Moss (yes, really, in 1981), and many other greats, and watched Clark, Hill, and Stewart from the grandstands. How I would love some way to compare them all with Lewis (and Fernando for that matter) other than in my mind's eye. That's the kind of simulator which would get my attention. Lewis doesn't waste an opportunity these days in cool-down rooms or press conferences to have a gentle poke at Max V. It so reminds me of the arrival of Senna and later Michael Schumacher when feathers were ruffled, but back then when drivers were chased around the paddock with physical aggression seemingly imminent. Gear up for the 2019 Formula 1 season, where you'll see every practice session, qualifying and race, with expert analysis and pit lane access, live on Sky Sports F1. And spare a thought for Valtteri Bottas in the other Mercedes, who finished fifth in the championship a full 161 points behind Hamilton. The one race where he really did master Lewis was Russia where he had to give up the victory, and to add his misery the mathematics overwhelmingly demonstrate that it wasn't at all necessary. On that subject Lewis says that he doubts Valtteri would want to be handed back a soft victory, but he happily took one in Sochi albeit with common sense at the time I suppose in the fight against Ferrari and Vettel. Valtteri needs a sports psychologist this winter if he doesn't already have one, and to take time out, look at his trophies and accolades to remind himself what a great driver he is, and to position his mind such that there's really nothing to lose now, just let the natural talent flow. Easier said than done when not only does he have to look at Lewis's tattooed back, his lap time data, and his rear wing in a race, but parked just over his shoulder now is reserve driver Esteban Ocon…. Vettel finished a fine second but it was a curiously anonymous weekend, I hardly remember noticing him except for when he did a very fast lap at the end of the race and I couldn't help but wonder why he'd left so much car and tyre performance in reserve in his pursuit of Hamilton. Kimi's Ferrari career ended up with a car failure which was sad, as did Pierre Gasly's Toro Rosso adventure. With only two of the 10 teams keeping the same line-up next year (Merc and Haas) and at least three teams with an all new line-up (McLaren, Williams and Sauber) there's an unusual amount of driver movement for 2019. And next year's grid will be minus Fernando Alonso. His incredible send-off over the weekend was like something I have never witnessed. Wall to wall 'farewell Fernando' which even the tough man himself seemed to be a little emotional about. The last thing I expected on the grid after interviewing him was a man hug! He may be 37 but I still expect him back on the F1 grid at some point if there's a suitable car. The whole celebration confused me in a way. If he's so popular, impressive and important, which he is, then why don't we have a competitive car for him? Talking of the grid-walk what a pleasure it was to have Billy Monger as my special guest. Five minutes before it all started we gave him an earpiece and radio, I told him that we'd try Alonso first and that I had no idea what would happen thereafter for the next eight minutes. Mind you he did gulp a bit when I told him we would be transmitting live to several million people around the world and so just pretend he's talking only to me and our target. He marched around with me and participated perfectly, while humbly receiving amazing compliments from legends like Alain Prost and Fernando. Bravo Billy. 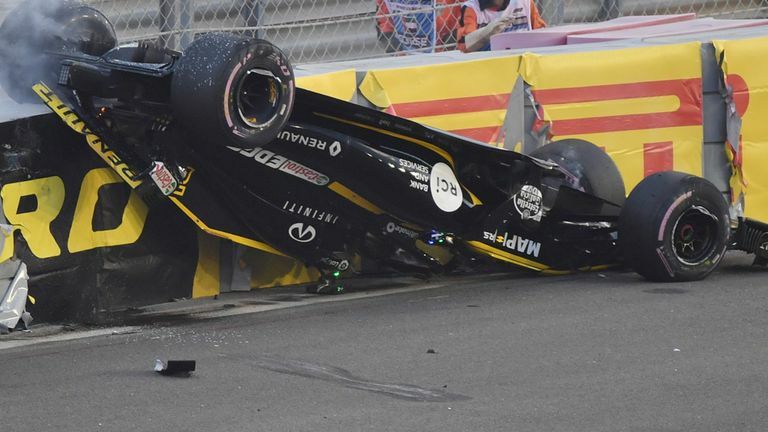 The Nico Hulkenberg roll-over was more spectacular than dangerous initially, and all the hard work achieved by the FIA and teams to create crash structures and contain wheels worked extremely well. But it's very difficult to get out of these cars at the best of times, with the headrest, confined cockpit, various tubes and cables, and all while wearing a HANS device around the neck and a crash helmet, four layers of fireproof clothing, and gloves. Add in the Halo frame and to curiously quote Hulkenberg, you're 'hanging like a cow' and can't get out when upside down. If you regularly read my words you'll know that I was always concerned about egress from the car in a hurry, along with parts being deflected into the driver which may otherwise have passed by, when the Halo was applied. And that it looked ugly. But I take no 'told you so' satisfaction from Hulkenberg's incident whatsoever because the Halo will work in other scenarios, it's just luck of the draw and maybe there will be a more elegant and less obtrusive solution in the future. Other strong performances in the race came from Carlos Sainz and Charles Leclerc, two guys I rate very highly, and who remind me, along with other young guns, what a great future F1 has. And so to 2019, when the cars will to all intents and purposes be brand new in terms of aerodynamics. The big teams have the resource to usually get it right first time, and major changes tend to scatter the field until the smaller teams catch up, which is bad news. Maybe, just maybe, someone outside of the top three teams can 'do a Brawn' and find something different which works. We'll have to wait until probably the second test in February or even Melbourne before we know the answer. Meanwhile, I hope you have a great winter and festive season, and look forward to sharing the highs and lows of F1 2019 with you soon enough.